The Denver show turned out good but not spectacular. 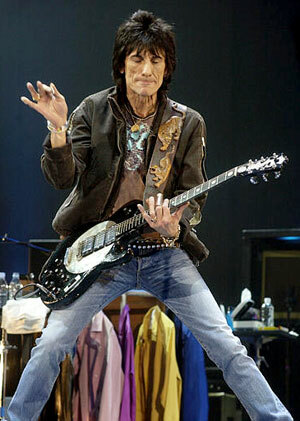 Ron Wood seemed to be playing at a higher level tonight, on songs that have increased in their appeal such as Don't Stop and Can't You Hear Me Knocking. It seems when Keith is not having a super-magical night (he was not tonight), there is more of an opportunity for Ron to step up and excel. I know that each person has a few songs they would not mind having omitted from the set list, and for me tonight it was Monkey Man. When the Stones kicked into this it made me wonder about the new material the band said they would start recording "when the tour was going like clockwork". When Monkey Man is played, it certainly seems like the tour is going like clockwork. Any studio time booked for Tokyo or Europe? While the Stones can definitely make old songs sound fresh it is a surprise that the popularity and success of Don't Stop have not led to any other new songs from 40 Licks to be played, or for new recordings to be mentioned. The Who tiredly trafficked on oldies for decades, but what has made the Stones so much better is their willingness to produce and present new things. When the Babylon tour had many new songs played, it did not put people off so fewer tickets were sold for the LICKS tour. LICKS shows are still excellent, and maybe there are reasons to strictly limit the material, but a few surprises (new-and yes-even old) can turn a good show into a great show. I just hope we soon hear about the new material talked about when this tour was announced. One very fresh and exciting thing took place when Jonny Lang came out to join the Stones on Rock Me Baby. It was one of the highlights of the show, but when Jonny stepped forward for his guitar solo his instrument was completely silent. Later in the song he could be heard, though it was very disappointing to be denied a chance to hear a Jonny Lang guitar lead backed by the Stones. Finally, Satisfaction deserves special mention as Keith's new bright silver and magenta guitar seems to have added extra spark to the song. 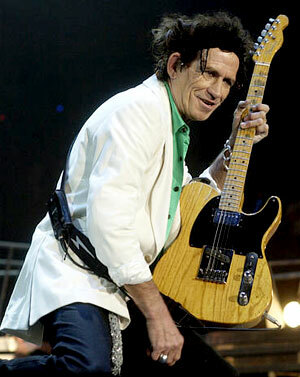 As in Oklahoma City, Mick at one point paid special attention to the guitar, to which Keith reacted by gesturing to it and sending a shrug and a laugh back to Mick. So tonight was a good standard one-night arena show, pleasant but not particularly thrilling. If that damn sound man had Jonny Lang plugged in or turned up on Rock Me Baby, it would have really made a difference. Having already seen two of the LA shows on this tour and watching the HBO special, I was ready for what 'I knew' was ahead of me. However, as soon as the guys took the stage and hit the opening chords to Street Fighting Man, I was taken aback by their manic energy that didn't stop throughout the entire show. Keith and Ronnie were truly thunderous in Denver, nailing tune after tune with ferocity like I've never seen. Keith was impeccable at carrying and holding everything together, while Ronnie was able to shine on tunes he nailed like Can't You Hear Me Knocking. It truly appeared as though everyone on that stage was having just as good a time as the 20,000 ridiculously lucky audience members were. In fact, the feel of the show was that of a club gig, not a large luxury-box-riddled arena show. This particular stop on the tour was highlighted by opening act Jonny Lang being invited out on stage to do an awesome take on BB King's Rock Me Baby. As always Gimme Shelter proved to be what it is: the best. Once the band made it out to the B-Stage to play a fast and hard cover of Muddy Waters' Mannish Boy, and give us the goods with a wicked Brown Sugar, it was apparent that even the Stones would say that Denver was a hell of way to spend a Saturday night. I won't even begin to mention the Jumping Jack Flash encore, unbelievable show. Cruising into town listening to K-Stone (K-Fox) radio turned Stones and they did a great job playing sound bites and great repertoire. My 15 year old daughter was with me again for her 6th Stones concert. We hit the motel and picked up my brother for his 1st Stones concert and headed to the show. This is my 10th show since 1978 and we are hyped !!! The stage is efficient and well manicured offering a great open stage with fantastic visual effects and excellent sound. Jonny Lang opened with a great set and he was very much appreciated. Then with no intro the lights hit Richards and Street Fighting Man is on. The crowd was electric. The Stones were high energy. We got a hell of a show on Saturday night. Mick mentioned the space shuttle tragedy offering hope to the world. He has such great insight into humanity. A truly gifted man with a great heart. Mick sounded better than ever. I was happy to see Ronnie playing so well and having so much more fun on stage. When I saw them all on stage the very first thing I thought was they are getting younger and they all seem more healthy. The whole show was a highlight in my life but the highest of highs came on Satisfaction, Dead Flowers and Can't You Hear Me Knocking. 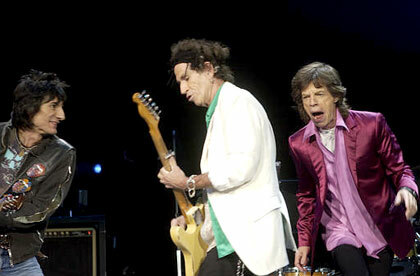 I was also blown away by Rock Me Baby because Mick had to work to get the crowd up. He is soooooooooo magical as a frontman. This was the best verson of Satisfaction I have ever seen. The crowd went into a wild frenzy and Mick knew he had us. The whole show was fabulous and outstanding!!! They are so human in their nightly feelings and emotions and yet they are definitely without any doubt in my mind LARGER THAN LIFE!!!!! When they went to the small stage the highlight of my daughters life was when Keith leaned over and wrapped her little hand in between his hands in a two second hand shake. She started crying after she recognized what had happened. Then Mick ends up giving her a high five also. That is truly an amazing gift of kindness and added memories for life. Ladies and Gentleman - the Greatest Rock and Roll Band in the World - the Rolling Stones - the Rolling Stones!!!!!!!!!!!!!!!!!!! The show is over and my head hurts, my feet hurt, my throat hurts and I LOVE IT !!! On the whole planet Earth no matter what was going on there was nothing bigger than to be in Denver Colorado to see the Rolling Stones and I was there along with my friends Greg and Amy, my brother Roger and my lovely daughter Ginny - peace to all - God Bless the Rolling Stones!!! It is truly a wonderful gift from life to be allowed the opportunity to feel the magnificence and splendor while watching the Rolling Stones!!! Jagger did tastefully acknowledge the Columbia tragedy, noting "it's a strange day and strange times we've got. We'll get through it" before going into an appropriate and uplifting version of their latest hit, Don't Stop. Thanks to Axel Schumacher for links information.